Although sometimes referred to as a snowshoe rabbit, Lepus americanus, the snowshoe hare, is a separate but related species that is bigger than most rabbits, possessing larger hind feet and longer ears. Some behavioral differences also set hares apart from rabbits, such as their tendency to run when threatened rather than freeze and hide as most rabbits do. The snowshoe hare is native to the northern United States and Canada. As the name implies, the snowshoe hare inhabits regions that are prone to cold weather and snow. This species is found throughout Alaska and Canada as far north as the Arctic Ocean. They can also be found in northern parts of the contiguous United States, as well as along the colder tops of the Appalachian and Rocky mountain ranges extending as far south as Virginia and New Mexico, according to National Geographic.com. Snowshoe hares prefer to live in coniferous forests found in cold climates, where the thick underbrush provides them with plenty of places to hide from predators. Unlike rabbits, hares don’t build nests or burrows, but live above ground year-round. The closest the snowshoe hare comes to nesting is when a pregnant female packs down a clump of grass in which to give birth. Snowshoe hares are well-adapted to their cold environment. Perhaps this species’ most distinctive adaptation is the one that gives it its name -- large, furry feet specially adapted for running on top of snow. Young hares are born hardy and fully-furred, and spend most of their days hiding on their own, only gathering to their mother a few times a day to nurse. Another distinctive trait is fur that changes color with the seasons -- reddish brown during the warmer months, and white during the winter -- allowing the hare to blend in with his surroundings at all times, the better to hide from predators. One thing snowshoe hares have in common with rabbits is that they are prolific breeders. Females have as many as four litters per year, with litter sizes ranging anywhere from one to eight. 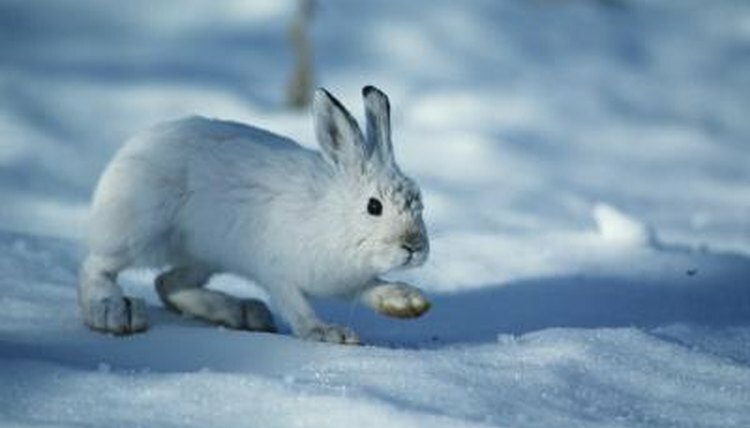 However, the snowshoe hare has several predators, including both carnivorous mammals and birds of prey. Because of this, only one juvenile hare out of every litter is expected to survive past the first year, and most adults only live up to five years. Additionally, the overall population tends to wax and wane cyclically every decade, likely due to disease, according to National Geographic.